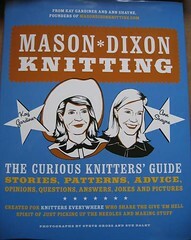 I bought Mason-Dixon Knitting from Loop on wednesday and I just haven’t stopped reading it. 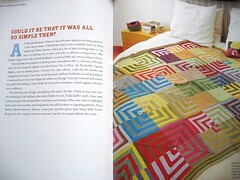 It is hands down the best knitting book i’ve read this year. This year and last year. Seriously. It’s funny, and inspiring, and full of simple ideas and patterns, with enough information for you to make them as complicated as you might ever want. It makes this lace-loving knitter want to wallow it mile after mile of garterstitch, because I see there is a point to it. See? 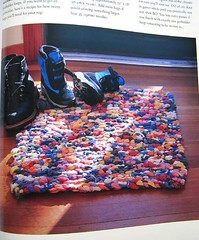 I mean, I even want to knit with cotton! But hey, a good book will do that to a girl. On the left are the honeymoon socks I finished as part of my Olympic UFO blast. 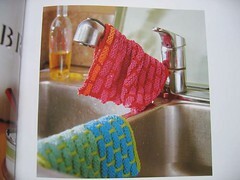 They are made from this sort of stringy merino yarn we bought in Venice. 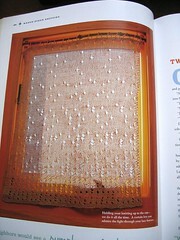 Very soon I’m going to start playing with the Camel Yarn I bought in Florence. It cost THE EARTH but is pretty much the softest yarn I’ve ever owned. Originally I was going to make arm warmers for cycling, and have four balls, but I can’t bear the idea that I might crash and ruin them. So at the moment I’m thinking more socks. The colours were too close, so the pattern looked fine up close, but on the foot, just blurred into each other. Also because I had to go up a couple of needle sizes to get the right overall size, the stitches ended up too big and stretched. 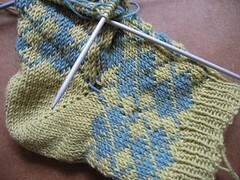 So they have been frogged and are becoming what there were always intended to be – another pair of lovely stripey socks. I’m half way through the second one at the moment so I’m hoping to show them off (along with my new shopping bag) in the next few days. But never fear – I did learn a HUGE amount about argyle while attempting them, and I’m looking forward to starting the Deep V Argyle once I’ve finished secret jumper II. In other news I am currently even more addicted to Top Gear than usual. And for no good reason, except that it is now shown every day on one of the satellite channels (at numerous times), and I think it’s a very entertaining piece of television. The fact I can’t drive doesn’t matter one jot.